Our charming, affordable and convenient Canal-side Cottage with 85 feet of water access on the boarders of Lake Erie seated on the Cedar Island makes a great choice for a stay in Kingsville, with the sandy beaches and clear water within a mere walk away and convenient geography allowing easy access to groceries and other goods. With a paddle boat, canoe and bicycles on standby, you may enjoy your time here however you wish to! The Cottage is furnished in a classic manner giving you a cozy vibe just like how it should, with Television, radios, BBQ grills and other accessories that comes along with the 3 bedroom (1 room with two beds, totaling 3 queen sized and 1 double sized bed.) and a parking lot that can house up to 5 cars We can house plenty of guests. The cottage is also a brilliant place for bird watching and canoeing, and with the calmness of the island you can enjoy your time here fully to your discretion. The Cottage in its time has been refurnished and updated many times with still many plans of great improvements for the future. William T. Moore - aka "Terry" a retired Ford Pipefitter by trade, has dabbled in small property rental management over the last 20 years. He shares this passion with his partner who also has 5 years of rental property experience and directed him towards a vacation rental in the heart of the Cedar Island area located in Kingsville Ontario. Together they are very excited about making this little Gem live up to its full potential in the years to come. Maybe it was coincidence, maybe divine intervention, but Terry grew up in a small township not far from the area called Blytheswood, a few kms from Leamington & Kingsville. The Moore family is related by marriage to the "Scratch" clan that were part of the early settlers in the area. Plenty of restaurants to try out, including Annabelle's Tearoom, Koi Sushi, family lunch and dinner at the famous "Train Station", Jacks Gastropub, & Italian fine dining. Just a stones throw to neighborhood beach, or a little trek down to the Cedar Island Beach - with children's play park, picnic tables, volleyball net and newly installed public washroom. 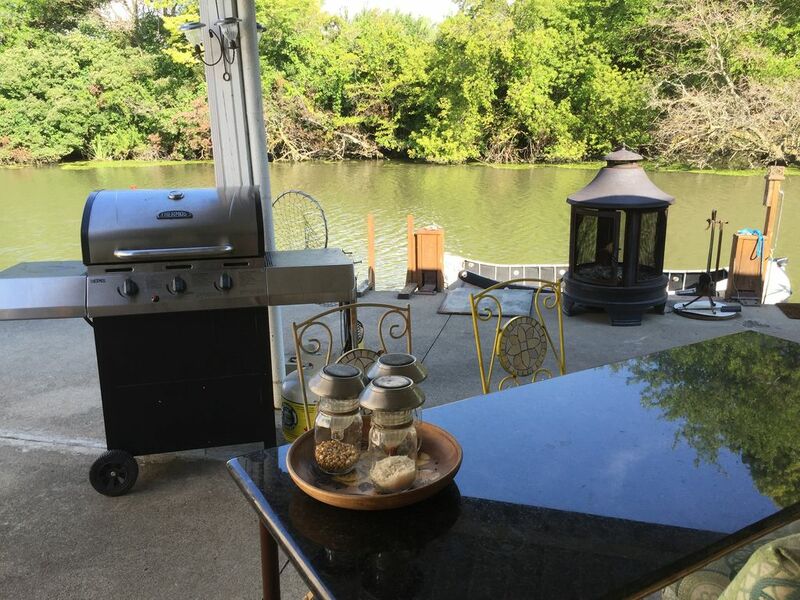 This quaint cottage backs on to the Cedar Creek with an 85ft of water access that will lead you out to Lake Erie. Motor boat, Jetski, Kayak or Canoe friendly. bathroom have 4 towel sets. Fully Stocked Kitchen - dishes, utensils, pots and pans, serving trays, bowls, some spices. Dinning table (seats 5-6) is located in back sun porch with view of Cedar Creek. There is also a portable card table and four chairs if extra dining is needed. 10 Board games for the whole family - Pictureka, Connect 4, UNO, Cribbage Board, Cards, Rumoli, Poker Chips, Life Game, Colouring books etc. Approx. 60 DCDs - Including family rated and children friendly movies. 85ft Deck (1/2 Cedar 1/2 Cement) - able to accommodate small to moderate size boat and additional watercraft. Kingsville Golf & Country Club - 10 minutes away. great birding and fish in the canal .what more can you ask ? Nice place to stay..very relaxing!! Watching the fish jump and the ducks herons and birds right from your patio is amazing! My only suggestion is a new teakettle and a safety rail across the dock. The cottage had an open concept layout, which looked nice after we cleaned the counters, the floors, and tucked their clutter out of the way. One of the bedrooms flooded the second night we were there. The next morning we learned from neighbours that it had happened several times prior. We also learned through the previous-days-newspaper, that Environment Canada was warning of flooding at that time. The property owner did not warn us that a flood was possible or likely, nor did he caution us against putting our suitcases in the lower bedroom. He scolded us when we phoned him in the night to tell him that his property was flooding. When he arrived, late the next morning, he showed us no concern, no consideration. He was on his cell phone while looking at repairs, while we packed our wet medication, ruined blood pressure cuff, sodden suitcases. We poured cement to raise the floor 6 inches higher to be sure its worry free from flooding in the future. We called and texted the traveler to apologize for the flooding,which we had no control over . We refunded the traveler’s funds right way and suggested the traveler contact VRBO customer service to get another place to stay for no extra cost. We phoned the VRBO customer service to let them know there was flooding . Beautiful views and great area. Cottage had everything we needed for a pleasant stay. Really nice beach and lovely views off the back deck. Terry was a attentive host. No fish flies. Cottage was as advertised. We had a wonderful time! The weather was amazing and the location is great! Lots of fun to do, fish, swim or canoe! The beach is gorgeous we spent many an hour down there! And enjoyed watching the wild life. Visited the wineries and the local fare. If you are looking for some R&R this is the place! This was our first time booking with VRBO and we chose one of the properties that seemed closer to a beach. The outside of this cottage is deceiving because it looks small but it's actually so spacious inside! All the renovations were great, and we were provided with things like firewood, a canoe, and there was a cute little barn bar right next to the home! On top of the great place, Terry was friendly and was extremely helpful. He made sure we were comfortable and gave us recommendations throughout our stay. Definitely somewhere we'd want to stay at again! Location, Location, Location, Our Cottage provides all, views, boating, sailing, swimming, canoe, wineries, conservation area, cycling trail, festivals, Golf, historical sites, antiques stores, art galleries, spas, restaurants, theatre, gambling and more. No ferry ride required just a small bridge.